Having an upcoming business event in Kamloops? Make sure to get the most out of it. Whether it is an open house, grand opening or sales event, it is a good idea to print a vinyl banner to impress and get noticed among your customers in Kamloops. Our Kamloops clients receive outstanding customers service, high print quality and fast turnaround time to succeed in their marketing and advertising efforts in Kamloops. 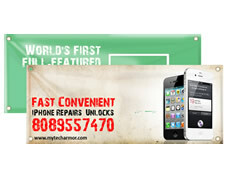 Banner for your Kamloops company, will be printed on 14oz durable scrim vinyl material. Printed banners are rated for indoor or outdoor use. Use them inside your office / retail space or outside as a signage for your Kamloops business. Let our professional design team to design vinyl banner for you or your company in Kamloops, to get the most out of it. They will make sure that your banner contains enough information and look great at the same time. Please contact us to get more information about the product, prices, turnaround times and available finishing options for Kamloops and area. We are more than happy to assist you over the phone, via email or in person. Ask us about Sample packs.